I hesitated to slap the "Throwback Thursday" label on this. Most the musicians I celebrate in this feature are those who left us years ago, Merle died yesterday. But his music has been an important part of American culture for the past 50 years or so. It's important historical stuff deserving of respect and veneration, And yet Hag's music still is a living force, still moving people, and still serving as a soundtrack for good times and lonesome times, still a soundtrack getting drunk and getting laid, for deep thought and deep forgetting. Like Hank Williams' songs that never get old, Merle Haggard's music will outlive us all. Merle Haggard meant a lot of different things to a lot of different people but to me he was THE songwriter of California. Not the California of Malibu, Silicon Valley or Beverly Hills but the California of Highway 99, migrant workers and the struggle to survive in the promised land. All the political ambiguity and one dimensional stereotypes aside, Mr Haggard was one of the giants of modern American Music (not just Country) along with Ray Charles, Miles Davis and Bob Dylan. Merle was a brilliant balladeer, soulful bluesman, guitar wrangler, musical trailblazer and one of our greatest songwriters/poets in the Roots tradition. In his way he was also a true, fearless rock and roll rebel. Rest easy from the long highway, Mr Haggard. It's been a hell of a ride. I got to see Merle in concert twice. The first time was in the early '80s at the old Albuquerque Civic Auditorium. I was covering the show for The New Mexico Sun, a bi-weekly paper in Albuquerque that didn't last very long. The main thing I remember about that performance was being impressed with what a great bandleader he was. He was emphasizing his western-swing influence that night and his band, The Strangers was one tight unit under Hag's command. Bob Wills would have been proud. The other time I saw him was in the mid '90s at Tingley Coliseum. That was the last concert I ever saw with my mom. The band was no match for the one I saw in the '80s, but they were good, Haggard started singing "Okie from Muskogee" and the crowd roared in approval. But after singong the very first line, he stopped the band and said, "Now who the Hell gives a damn whether or not they smoke marijuana in Muskogee?" So today let's celebrate the songs Merle Haggard gave us. Today's that someday we look back and say it was fun. Here he is on the Porter Wagoner Show, in the late '60s, I think, singing "That Little Old Winedrinker, Me " and one of his greatest tunes, "Today I Started Loving You Again"
In 2011, Willie Nelson joined Merle on stage to help him preach against the evils of marijuana in Muskogee. "Someday We'll Look Back" is one of Merle's most soulful tunes. And here's a fairly recent version one of his earliest hits, "Sing Me Back Home." 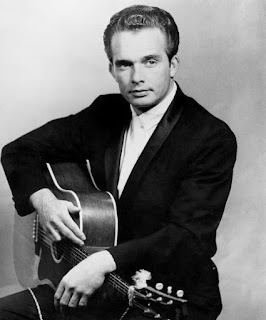 Tune into The Santa Fe Opry Friday night (KSFR, 10 p.m. to midnight) for the mother of all Merle Haggard tributes.